KOD -Multi & Epi- is a high-fidelity PCR enzyme based on genetically modified KOD DNA polymerase(UKOD). This modified enzyme enables amplification from templates containing uracils (U) or using primers containing inosines (I) and uracils (U). Furthermore, addition of the Elongation Accelerator significantly reduces amplification bias during PCR. 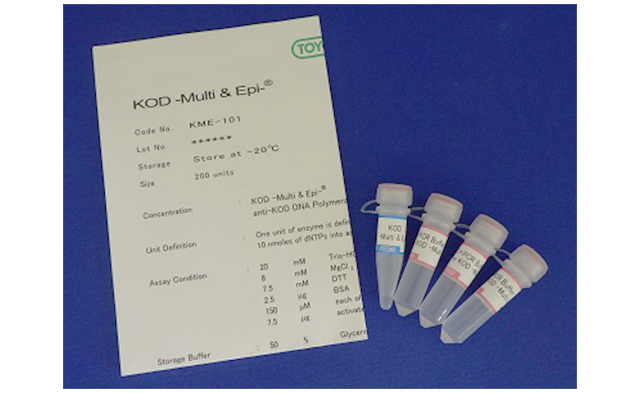 KOD -Multi & Epi- can be applied to various purposes such as a) multiplex PCR, b) bisulfite PCR in epigenetics research, and c) metagenomics research. This enzyme is also applicable for the preparation of DNA fragments for next-generation sequencing and capillary sequencing via cloning because the enzyme exhibits about 11-fold higher PCR fidelity. KOD -Multi & Epi- contains two types of anti-KOD DNA polymerase antibodies that inhibit the polymerase and its 3ʹ→5ʹ exonuclease activity, thus allowing for Hot Start PCR. Furthermore, KOD -Multi & Epi- generates blunt-end PCR products because of its 3ʹ→5ʹ exonuclease (proof-reading) activity.